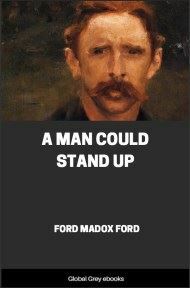 A Man Could Stand Up is the third novel of Ford Madox Ford's highly regarded sequence of four novels known collectively as Parade's End. It chronicles the life of Christopher Tietjens, "the last Tory", a brilliant government statistician from a wealthy landowning family who is serving in the British Army during World War I. The novel opens on Armistice Day and follows the fortunes of Tietjens and Valentine, until their paths finally cross again in post-war London.